In the last 24 months or so after being ensconced in Bangalore’s weather, complaining about it at times, I lost touch with people. Don’t take that statement literally. I have met or chatted with 500+ entrepreneurs and added 1500+ connections. A lot of these discussions were single-shot. While I added these “connections”, I lost touch with many whom I could have continued to maintain the links. Old friends, colleagues, extended family. A lot of new connections I could have solidified from the single-shot to people where there is an ongoing life-long conversation. It never happened. I was too busy being on the altar. There are emails waiting for my replies, there are unopened facebook pings and others I have ignored totally. This is bad and weakening. On one side, I was (and continues today) gathering lots of “connections”, on the other, the stronger sub-graphs are being rendered non-traversable. I fear they would become weaker as life goes on. Yesterday night, I decided to rework the connections. Today, few hours ago, I did the 1st call and shall continue everyday. If you happen to get a call from me, totally out of blue, it’s not that I’m bean counting, but I do care about re-strengthening the connection. 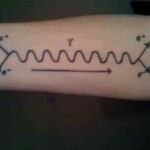 The picture is the famous Feynman diagram (someone tattooed it in his arm! ); where an electron traveling from Point A to Point B happens to bump into a photon and is found to be at two places at the same time. Guess, as humans, we don’t need that subatomic experiment and want to be found at only one place at one time! Picture via talklikeaphysicist. The moment I made up my mind to come out from the “other side”; the next-second got busy into what’s the next thing. Several ideas, and several discussions with friends, ex-colleagues and advisors. A lot of times, things went into, “Let’s do something big, yaar”. The “big-ness” got defined by the size of consumers who could potentially use the product, as in “Let’s do something big on facebook (as a platform)” or “Let’s do the next big thing in mobile” instead of the size of the impact the solution could have on the customers. @1ndus you are on the crease. playing. that’s usually enough. Take a proper stance and cover your assets with a nice AD guard! @1ndus Test match hai dude. Think sessions, not overs, even as you capitalize on the loose deliveries! @1ndus Simple think. Do as @sachin_rt does. Care only for the next ball; not for overs, innings or sessions ! RIP, Sixer in every over. Welcome, six runs on six well-played balls. 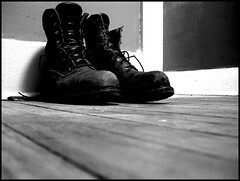 No, I’m not hanging up the boots. Just polishing it again for a yet another trek. On one side, I was having way too much fun talking to young entrepreneurs, speaking at events, giving gyaan, moderating panels, doing Friday sessions at Leela, etc etc. Then I was getting rusted. The brain was getting claustrophobic, not getting into action. Hence decided to take the plunge again. I wanted to come out and write some code, do a few apps here and there, before figuring out what to do next. It has been an awesome ride at Morpheus. We recently did the 2nd demo day (and the 1st Open Gurukul) at Bangalore, which was attended by 35 investors and 100+ entrepreneurs. Unforgettable, how the 2 years quickly passed. Portfolio swelled to 33, companies got funded, another half-a-dozen raised subsequent angel rounds (a lot of them not disclosed, yet). Even chased chickens at the Morpheus Gurukul last year. Sameer (@guglanisam) & Nandini (@nandinih) are doing an awesome job, keeping the baton while I move on. I’ll be around in a limited professional capacity at Morpheus. So It begins again for me. What I’m doing next? Honestly, dunno 100%. I have some ideas what to do next, but don’t ask Jyoti (my wife), she knows what should I do next! This blog post was not suppose to happen for another 15-20 days, but the news of the transition got picked up by VCCircle/Techcircle.